Sportscar or family vehicle? The new Panamera has the potential to fulfil both of these roles, says Porsche. Now it has been put to the test by someone who should know: Kai Bösel is a father, owns a racing licence and has launched his first start-up in the automotive sector. You could say the Gran Turismo was built precisely for him. He also regularly tests family vehicles for his online magazine "Daddylicious". So it’s straight into the car and out on the road. His first impression? “Everything is well finished, the interior gives off an impression of high quality and tidiness”, says the expert. With a car in this segment, however, this is only what you would expect. 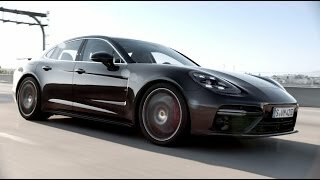 What makes the Panamera a good family car? In comfort mode, we take a leisurely drive through the centre of Leipzig. Kai Bösel explains: “I used to be active in the car blogging scene and I tested a lot of great vehicles”. Then his daughter was born – and his focus shifted overnight. “Suddenly, there was a whole new world of important criteria to consider when buying a car”, he says. “Is there enough space for the family? Where can I attach the child seat? What safety systems does the car have?” The answers to these questions: The Panamera fits four passengers comfortably, the luggage compartment has been expanded to 500 litres – 50 litres more than in the previous model, the Isofix fitting in the back seat comes as standard, and the safety and assistance systems are the most state-of-the-art in the entire Porsche vehicle range. 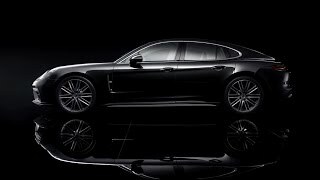 That covers the fundamentals of being fit for a family, but can the Panamera do more? The best place for our expert to test that is on the race track. On the company's own race track at Porsche Leipzig – the production site of the Gran Turismo – Kai Bösel and the Panamera show their other sides. At the steering wheel, Kai turns the rotary switch to Sport Plus. At once the engine becomes louder – you can feel that the vehicle is now ready for the race track. And so is Kai. “A wolf in sheep’s clothing”, he says, and steps on the accelerator. Just looking at Kai’s face tells you that the Panamera is the right car to satisfy that adventurous side. It is also clear from the Panamera's data sheet. In the Turbo version, the Gran Turismo accelerates from 0 to 100 km/h in just 3.6 seconds with a V8 bi-turbo engine and 404 kW/550 hp (combined fuel consumption 9.4–9.3 l/100 km; CO2 emissions 214–212 g/km). The Porsche reaches a top speed of 306 km/h. With a family in the car, parents will probably not want to reach such high speeds, but the Panamera has proven that it really can be a sportscar too. With its elongated, dynamic proportions, its pronounced shoulders and athletic flanks, it is reminiscent of the 911 design icon. Kai Bösel is dad to a blended family and belongs to the first generation of online bloggers. He has launched four start-ups, and has been blogging since 2006 about cars, and since 2013 about topics for dads in his online magazine for fathers, DADDYlicious. He also writes as an editor for various family magazines. He is a runner, but also a passionate driver with a soft spot for race tracks, modern classic cars and family vehicles.